Goodman, 30, is a commercial surrogate, meaning she is being paid to carry a baby for someone else. For her, taking the job was an emotional decision, born of a desire to help an infertile couple start a family. But it also made financial sense. 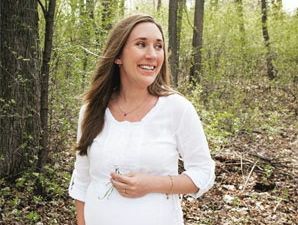 When Goodman signed up for surrogacy in 2007, her husband, John, 31, was earning about $26,000 a year working for the United States military in Florida; she made more as a bank teller, but the $26,000 Goodman will receive for carrying the baby to term will be a godsend, enough to start a college fund for their children. Although you'd hardly know it from meeting this personable, all-American mom, Goodman is part of a brewing controversy surrounding surrogacy. Approximately 1,000 surrogates give birth in America every year, according to one informal estimate, and surrogacy industry insiders say a disproportionate number are military wives. Because no one keeps nationwide records, exact numbers are impossible to come by, but to get an idea of how common surrogacy is among military spouses, consider this: Active-duty U.S. service members make up less than one half of one percent of the U.S. population. Yet agencies Glamour spoke with said military wives make up 12 to 15 percent of their surrogate pool. And according to an unscientific poll on the popular surrogacy support group website surromomsonline.com, more than 19 percent of respondents said they were military surrogates. What drives these women to take on such an emotionally and physically demanding job? All of the surrogates we spoke to cited the desire to help another couple finally have a family. Then there's the bottom line. Financial concerns figure into these decisions — for military wives, often struggling to make ends meet; for infertile couples who could save thousands of dollars using a military surrogate; and for agencies happy to make such a match. With some Web research, she found surrogacy-agency sites where she learned more about what it takes to serve as a surrogate, and read heartbreaking stories from couples desperate for a carrier. I'm perfect for this, Goodman thought. She loved being pregnant with her own two children, and their births were quick. “With my daughter I was at work right until 7:30 P.M. and delivered at 9:45 P.M.,” she says. “I didn't know I was in labor all day.” And the money was undeniably irresistible: How many chances do you get to make an extra $26,000? A few months after watching the Army Wives episode, Goodman filled out an online application and questionnaire, and submitted it to an agency. Within two weeks, someone got back to her. She'd passed the initial screening. For final approval, Goodman had to undergo a series of extensive psychological and medical evaluations. Once she got the OK, it was time to find a couple who wanted her to carry their baby. In August 2009, after two failed attempts at in vitro fertilization (IVF), Goodman was impregnated using the sperm of the husband and an egg from a donor. She took the whole process very seriously, meeting the couple twice before she became pregnant, then chatting weekly on the phone and e-mailing daily during the pregnancy. Goodman also kept a meticulously detailed log of every doctor's appointment and pregnancy milestone. Synesiou's center isn't alone; many surrogacy agencies heavily market to military wives. Classified ads seeking surrogates frequently run in areas with large military populations. In a recent issue of one magazine distributed on bases in the San Diego area, there were three ads looking for surrogates. One said, “Earn $24,000-$40,000.” Another appealed to altruism: “Help an infertile couple build the family of their dreams.” But military wives' sense of duty and responsibility is only one reason agencies are so eager to land them as surrogates. Money plays a role too — since some agencies know they can cut their clients' costs by using a military surrogate. Surrogacy, after all, can be an expensive choice for couples. Clients typically pay $100,000 to $120,000, which covers costs for procedures like IVF, agency and legal fees, and the surrogate's compensation. And if the surrogate's insurance doesn't cover the medical expenses, the couple generally purchases a policy for her, which can add another $25,000 or more to the tab. And here's where military wives are different. Many insurance companies in this country explicitly state that they will not provide pregnancy coverage if a woman is having a baby for someone else. In some cases, companies have even been known to investigate births; if they learn a baby was born to a surrogate, they may bill her for costs incurred. But Glamour's investigation found that it often doesn't work that way for the military's insurance provider, Tricare. According to industry insiders, the company has a history of paying for a surrogate's medical expenses. Officially, Tricare says it doesn't cover surrogacy, and “if [a military spouse] is serving as a surrogate parent [using Tricare insurance], then we have a legal obligation to recoup the cost of health care,” says Austin Camacho, Tricare's chief of public affairs. And indeed it sometimes does. In one case, after a military wife spoke to the media about being a surrogate, she said Tricare billed her $100,000 for the costs of her pregnancy and resulting medical complications. Tricare's relative leniency is an open secret in the surrogacy industry. An agency may even offer special incentives for military wives because of the savings they bring; one California-based agency had agreed to pay any military spouse who used her Tricare policy for surrogacy an extra $5,000. At her agency, Synesiou says surrogates have used their Tricare insurance to pay for doctor's visits and hospital stays. She adds, though, that some military surrogates choose not to use Tricare coverage, because private insurance often offers more flexibility and choice of doctors. Others prefer to leave Tricare out of their surrogacy jobs: Emily Jackson of Stillwater, Oklahoma, whose husband is in the Navy, has been a surrogate mother to five babies in the past 10 years and refused to use Tricare to pay for any of those pregnancies. “I don't want to risk getting a huge bill,” Jackson says, “or even losing my health insurance.” But she may be an exception. But in online groups catering to military spouses, some commenters say these women have gone too far. “I admire any woman willing to be a surrogate. However, I do not think those people…should abuse the benefits put in place for military families,” one wrote on the website Military SOS (Significant Others and Spouse Support). As the Goodman family struggled to stay afloat, there was one relief: John's severance package from the military meant they'd have the same health insurance through Goodman's pregnancy. She gave birth, to a baby girl, in April. “It was the greatest feeling ever to watch my couple finally get to hold her,” Beth says. Hilke Schellmann is a native of Germany, a Fulbright Scholar, and a veteran documentary producer.